You’ve probably used cornstarch in the kitchen for years. This stuff is great for so many recipes and is required in many recipes for thickening. You may have used it in homemade puddings or gravies. But did you know that there are other uses for this amazing kitchen product outside the kitchen? 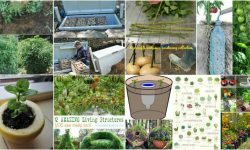 I love finding natural cleaning recipes so I started looking for a few with cornstarch. 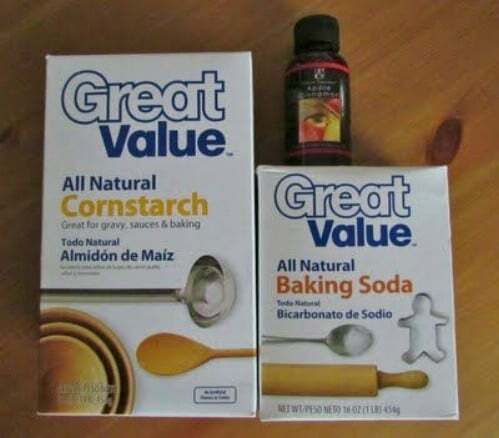 I’ve heard that it’s great for cleaning windows and removing soap scum, so I started gathering recipes for cleaning and found that there are many other uses for it as well – in fact, I’ve got 15 recipes for household uses for cornstarch that range from cleaning to DIY makeup! If you have never used cornstarch outside the kitchen, you are in for a wonderful surprise. 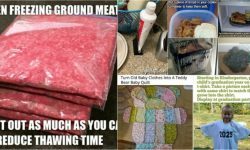 You can make so many great things with cornstarch and all of these recipes are simple to follow and use ingredients that you probably already have on hand. Whether you’re looking to make a homemade remedy for athlete’s feet or you want a great dry shampoo that will leave your hair healthy and clean – cornstarch is about to become your favorite kitchen staple. And if you like finding recipes for natural cleaning products then you should also check out these 5 household uses for baking soda. DIY household cleaners and other products are so much safer to use than those that are ridden with chemicals. If you prefer making your own products, you are really going to love these cornstarch recipes. And, if you love finding alternative uses for things in the kitchen, you should also take a look at these 6 alternative uses for sugar. You will be surprised at what this basic kitchen staple can do. This DIY soap scum remover will clean your bathroom so beautifully and it is really cheap to make. Aside from cornstarch, which is really effective at helping to scrub away that nasty soap scum, this one has vinegar and dish soap – whatever kind you normally use. This is one of those amazing cleaners that you can make with ingredients that you likely already have in your kitchen! You’ve probably heard of using vinegar and rubbing alcohol to clean your windows and mirrors but I wonder if you have heard of adding cornstarch to your homemade window cleaner? You probably already know that there are some amazing alternative uses for alcohol. Cornstarch helps your cleaner to do the job without leaving unsightly streaks. 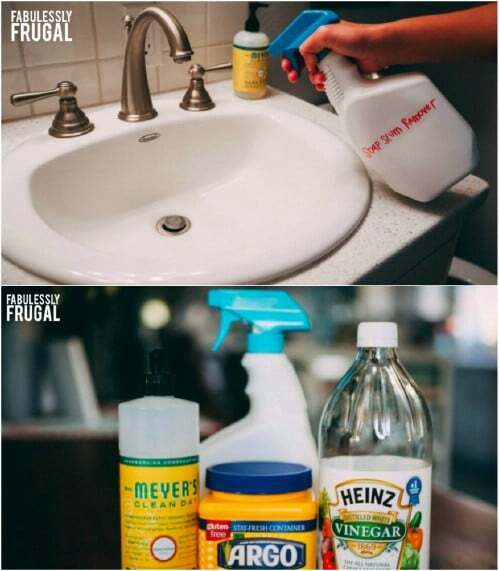 This is a great recipe that will remove even the toughest glass stains – like toothpaste on the bathroom mirror – and leave all of your glass crystal clear and free of streaks. Mothers have been using cornstarch to help clear up baby rash for decades. It’s a very gentle and very effective remedy for diaper rash and you don’t really need a recipe – or any other ingredients to make it. Many pediatricians actually recommend using cornstarch as opposed to baby powders that contain talc – given the bad publicity that talc has received lately. You can use a dusting of cornstarch to help treat or help prevent diaper rash. The basic idea behind a dry shampoo is to remove oils that make your hair look dirty. Cornstarch is excellent at removing grease and helping your hair to look fresh and clean. Cornstarch has excellent oil removing properties and when you mix it with a few other ingredients, it makes a wonderfully smelling dry shampoo that will also be helpful when you are styling your hair. Cornstarch is very effective at helping to combat athlete’s feet. In order to cure athlete’s feet, you need to keep moisture away from your feet. This is where the cornstarch comes in. You can make your own effective, soothing and really great smelling foot powder and keep it in a jar to sprinkle on your feet when you get out of the shower or whenever you change shoes or socks. And, this is much cheaper than anything that you can buy in a store. Do you know how expensive makeup is these days? Did you know that you can make your own makeup and that it is much healthier for your skin? This DIY bronzer and contour powder is made from cornstarch which will help to keep oil off your skin and make it less shiny. It’s a really easy makeup to make and you only need cornstarch and a few things from your kitchen pantry to make it. This DIY face mask has an instant lift effect – it will instantly make your skin look tighter and younger! And, it is made with cornstarch. You probably have all of the products that you need to make this in your kitchen right now. It’s really simple to put together and has such a wonderful instant effect. Plus, this is so much cheaper than anything that you can buy that will do the same thing. 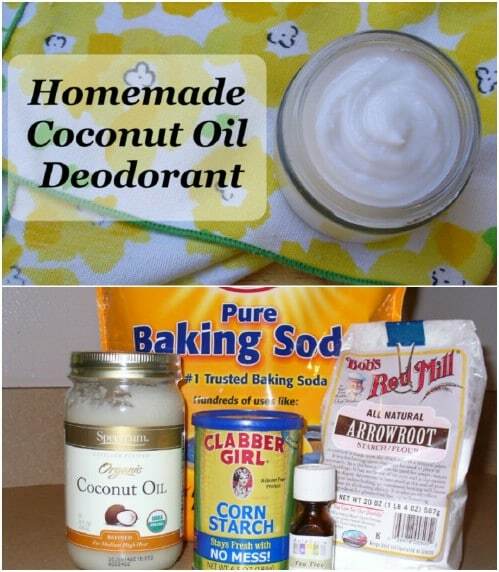 This homemade deodorant is made from coconut oil – there are so many amazing beauty recipes with coconut oil – and it has cornstarch in it that gives it a great antiperspirant effect. If you want something that is going to smell amazing and keep you dry, this is a great homemade deodorant to try. It is all natural and so much less expensive than those other antiperspirants that you can buy in stores. Cornstarch is also great for your carpets. This recipe uses cornstarch along with baking soda to give your carpets a cleaner and fresher look and smell. You add your favorite essential oil to give it the scent that you want. Just mix the ingredients together, sprinkle on carpets and vacuum away after a few minutes. This one works just as well as anything that you can buy. Cornstarch helps to absorb odors so when you mix it with herbs, it makes an excellent deodorant for the cat box. 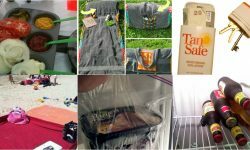 If you have indoor cats, you know how frustrating it can be to try to keep that smell out of the house. Add a little cornstarch to the mix and you will instantly notice an improvement. It also helps with moisture control so you may not need to empty the box as often. Some spray starches contain ingredients that are unsafe and can be very harmful to your family. I don’t iron a lot – I try to avoid it – but when I do, I want an all-natural spray starch that is safe to use. Enter cornstarch. 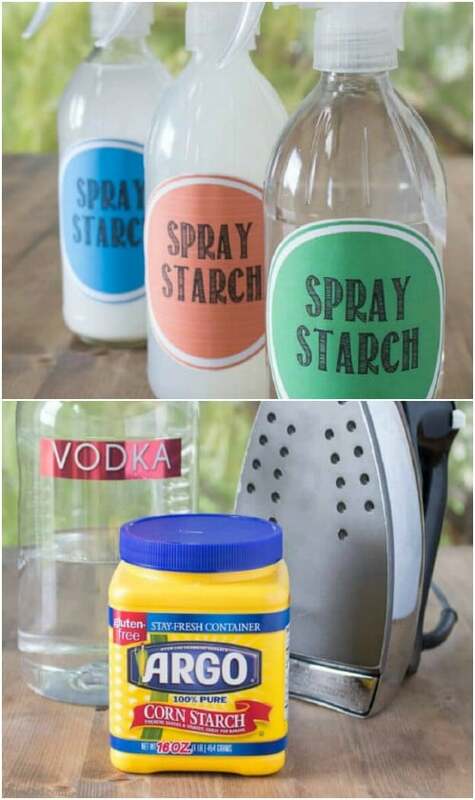 You can make a spray mixture with cornstarch that will perfectly starch your clothing and fabrics and it is very safe to use. There is no butane or other chemicals and no aerosol. And it does the job very well. 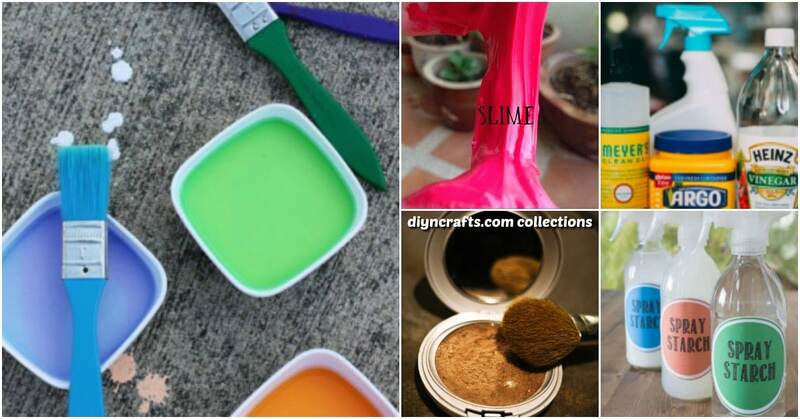 Have you made homemade slime with your kids? You really need to and this recipe using cornstarch is safe and fun, and it makes a really great slime. 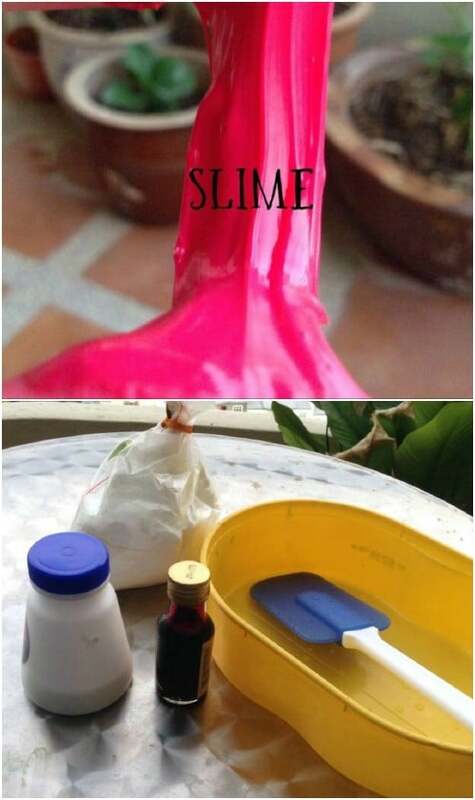 This is a super simple slime recipe and it only takes a few minutes to mix up. You can keep this for a long time in a tightly covered container and make it in any number of fun colors. Keep this recipe on hand for those cold winter days when you want winter crafts for kids that will keep them entertained indoors. Cornstarch works really well to remove stains and odors from your laundry. This is a great pretreating product for before the wash. It’s really effective and works wonderfully on greasy stains. And, you don’t really even need to do anything special except dust the clothing with it to mop up the stain. Plus, you can add a bit of cornstarch to your wash water to remove nasty odors. You can use cornstarch to make a really luxurious body dusting powder that smells wonderful and makes a gorgeous gift. If you plan to give this as a gift, just store it in a decorative container and maybe add a powder puff. 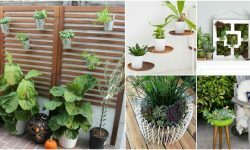 You can use different herbs to get the scent that you want and the cornstarch helps to hide odors and remove oils from your body. This is a really easy dusting powder to make and you can also use it as a scented dry shampoo. 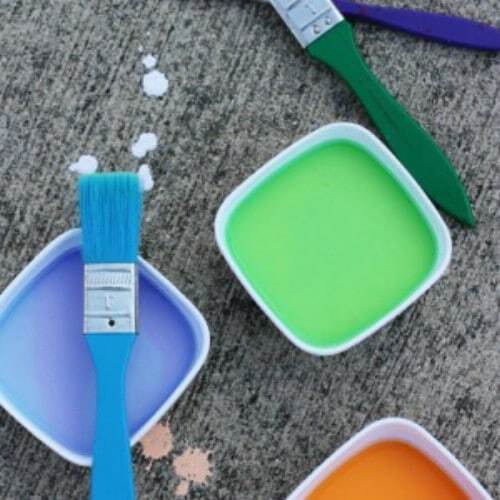 Instead of paying money for sidewalk chalk, make it yourself using cornstarch. 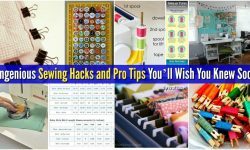 This is a really simple process and kids are going to love all of the different colors that you can make. This is more liquidy than regular sidewalk chalk so you will need various paintbrushes to let the kids color the sidewalk. The chalk paint is water soluble so it washes right away the first time that it rains.